Biotite is a member of the mica branch of the silicate mineral group. It is common as a rock-forming mineral and is found associated with muscovite, feldspar, and quartz. 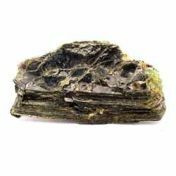 It has a widespread occurance and is present in all three rock types igneous, metamorphic, and sedimentary. It is classified as a Phyllosilicate. Biotite is typically black to brown in color, but it can be difficult to distinguish it from other similarly formed metamorphic rock such as phlogopite, another brown, silicate mica. These two minerals can range in color from dark brown or black, often with a greenish tint. The one consistent distinction is that Biotite alone can occur with a reddish tint. This is due to the higher iron content in Biotite. Pholgopite is iron poor so does not exhibit the red coloration. The challenge to distinguish Biotite from Phlogopite is a good demonstration of why color is an unreliable basis for identification of minerals. The mica group is characterized by the layered structure of iron magnesium aluminum silicate sheets. The sheets of Biotite are connected through weak bonding of potassium ion layers. This allows for the perfect cleavage that produces thin sheets of the iron magnesium aluminum silicate in Biotite. The perfect cleavage of the mica group minerals makes fracture less easily observed. Mica group minerals have an uneven fracture characteristic. Location: Biotite is found in many rocks around the world. Noteable deposits are found in Evje, Norway; Bessnes, France; Uluguru mountains in Tanzania; Ontario, Canada; and Laacher See, Germany.